Raleigh News & Observer: In this piece, Andrew Carter talks about North Carolina’s Marcus Paige, who’s trying to regain the shooting form that made him a preseason All-American. With his accuracy numbers (35.5% FG) significantly down compared to last year, you have to wonder if Paige is feeling the pressure of being North Carolina’s only viable perimeter threat this season. He probably needs to regain that touch soon if the Tar Heels want to hang with top-ranked Kentucky in Lexington on Saturday (12 ET – CBS). While Kentucky is a bad match-up for most any team, they are a really bad match-up for teams that score almost exclusively from two-point baskets in the paint. Currently, North Carolina ranks 14th in the country in percentage of its points derived from two-pointers, while Kentucky leads the nation in defending two-point attempts, allowing only 30 percent. It would help the Tar Heels’ cause if forward Brice Johnson played well, but don’t count on it. A look at Johnson’s game-by-game statistics so far this year reveals a disturbing trend. In contests against the team’s four worst opponents, Johnson has solid numbers (16.0 PPG, 10.0 RPG, 61% FG); but against the team’s four top-40 opponents, his production has basically been cut in half (7.0 PPG, 5.0 RPG, 32% FG). South Bend Tribune & Seminoles.com: Notre Dame visits Florida State on Saturday (8pm ET – ESPN2) in an early conference match-up between two teams that appear to be moving in opposite directions. 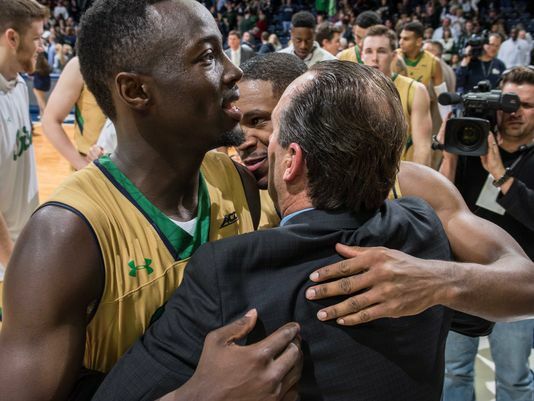 The Irish (9-1) are off to nice start and entered the AP Top 25 earlier this week. The Notre Dame offense has been on a tear, averaging 85.1 points per contest while leading the country in field goal shooting (56.2%). On the other hand, the Seminoles (4-4) have been one of the more disappointing teams in the ACC. But in fairness to Leonard Hamilton’s squad, it has been beset by injuries to their two primary guards. After missing two-and-a-half games, Aaron Thomas returned to action last week and looked back in top form, with 22 points in Florida State’s 96-73 victory over Central Florida. Hamilton hopes to get starting point guard Devon Bookert back for the Notre Dame game, after he missed the previous five games due to a foot injury. Fox Sports: In a game that didn’t get a lot of attention, Clemson rallied for a big overtime home win over #18 Arkansas this past Sunday evening. With all the hoopla surrounding the new NCAA football playoff selection coupled with a normal NFL Sunday, many didn’t notice that the Tigers gained their second win this season over an SEC squad (the other was LSU). Ironically, Clemson’s next two games are also against SEC members, Auburn and South Carolina. In Sunday’s win, Brad Brownell’s guys showed flashes of the defense we have come to expect from Clemson, holding the potent Razorbacks to a season low in points and points per possession (1.04 PPP). In each of Brownell’s first four years at the helm, the Tigers have ranked among the nation’s top-60 in adjusted defensive efficiency, but even after Sunday’s strong performance, Clemson only ranks 121st this year. Pittsburgh Post-Gazette: Jamie Dixon was happy to welcome Cameron Wright back to action last Friday in the Panthers’ 76-62 win over crosstown rival Duquesne. Wright only played a token minute, but after a week of practice the senior wing should be ready for more minutes this weekend when the Panthers host St. Bonaventure on Saturday. Dixon hopes that Wright’s return will have a positive impact on the Pitt defense, normally a program strength but an inconsistent liability so far this year. In each of the Panthers’ three losses, opponents torched the Pitt defense by scoring over 1.2 points per possession, a mark only bested by three Panther opponents during all of last season. Winston-Salem Journal: In a bit of a surprise on Tuesday, sophomore guard Miles Overton informed Danny Manning that he would be leaving the Wake Forest program, effective immediately. It wouldn’t have been as big of a shock if the announcement had come about a week earlier, as Overton had only logged 49 minutes of playing time in the Deacons’ first six games. But last week, he saw a lot more action, scoring 22 points in 40 minutes combined in his last two games. In any case, by leaving now, Overton can transfer to another school for the spring semester, and be eligible to play again next December. Over the last two weeks, we have previewed each team individually to go with several more articles to get you ready for ACC basketball (first tip: 6:00 PM ET in Durham). Links to the previews can be found in each of the preseason power rankings listed below. Also look for our preseason conference awards which will publish later today. 1. 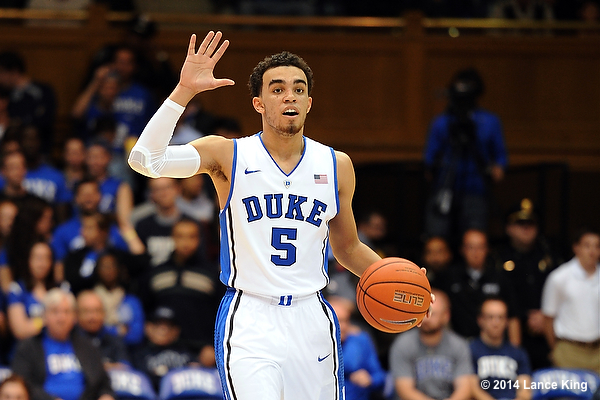 Duke (58): Everyone knows about the freshmen, and they are sensational. But are Quinn Cook and Rasheed Sulaimon ready to put together a consistent season from start to finish? That answer may determine whether the Blue Devils are Final Four-bound or facing another early departure from the Tourney. T2. Virginia (53): Joe Harris and Akil Mitchell didn’t light up the scoreboard in Charlottesville, but their leadership and savvy was key in Virginia’s magical run last year. Can Anthony Gill and Justin Anderson assume larger roles and keep Tony Bennett‘s team in the national limelight? T2. North Carolina (53): Everyone knows about Marcus Paige, and the Tar Heels should be better at the line and from three with the addition of some talented freshmen in the backcourt and on the wing. Brice Johnson, Kennedy Meeks and Isaiah Hicks have to bring it every night in the paint for this team to reach its potential. 4. Louisville (52): The Cardinals probably have as good a shot as any of the top four. While they will have to learn how to play a new set of conference opponents in unfamiliar arenas, the ACC will have to adjust to Rick Pitino’s style of pressure defense with multiple schemes. Most of the key contributors are now gone from the 2012-13 National Championship squad, but the program brings a culture used to winning at the highest level. 5. Syracuse (42): There are a lot of questions about the Orange after Tyler Ennis’ and Jerami Grant’s early departures. Jim Boeheim has a talented team that won’t be an easy out, but there are a lot of questions about how the offense will run with another freshman, Kaleb Joseph, at the helm. 6. Florida State (38): The Seminoles haven’t been their usual defensive selves the past two seasons, but this year Leonard Hamilton has three experienced big men along with a cadre of long perimeter players. Aaron Thomas may be the most underrated player in the ACC, which bodes well for things in Tallahassee this year. 7. 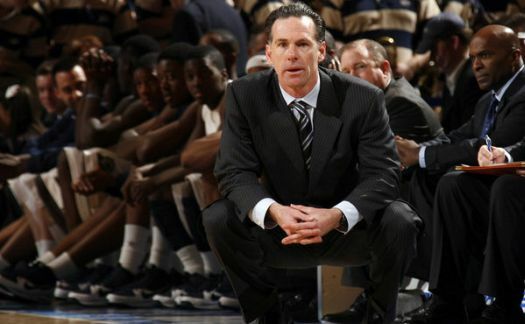 Pittsburgh (37): Jamie Dixon has a tradition of replacing departed stars with veterans. For Pitt to win games against the ACC’s elite, Cameron Wright and James Robinson must continue that trend and get some help, maybe a year earlier than the norm, from the talented sophomore class. One would think they are due for a healthier year than last, when midseason injuries really set the team back. 8. NC State (34): T.J. Warren is gone, so this team has to find its offense by committee. Tyler Lewis is too, so Cat Barber will have to be efficient and also seek his own shot. The maturation of a young frontcourt will be key. Mark Gottfried has historically impressed with low expectations. 9. Notre Dame (32): It won’t be a surprise if Zach Auguste makes a big jump in production as a junior, but beyond that is nothing but unproven post players. With the perimeter filled with talent and experience, keeping Auguste healthy and out of foul trouble may be the key as the Irish try to make a dramatic jump in the standings. Jerian Grant is a contender for ACC Player of the Year. 10. Miami (25): Arguably the best coaching job in the country last year happened in Coral Gables. If Jim Larranaga gets this team to improve, the Hurricanes will be significantly better than many expect. Manu Lacomte needs to make the leap and lead a young team in a very tough conference. 11. Clemson (18): Brad Brownell showed that even without a ton of obvious roster talent, the Tigers will be competitive — especially on defense. This season he has to prove that again without K.J. McDaniels. It’s unclear who the go-to player will be, so Clemson’s offense could hold this team back. 12. Wake Forest (17): Wake may be ready for a solid rise in the ACC standings as early as next year. This year will be a challenge, but momentum could be built towards a good 2015-16 season. Juniors Devin Thomas on the inside and Cody Miller-McIntyre in the backcourt will dictate how good this team is. 13. 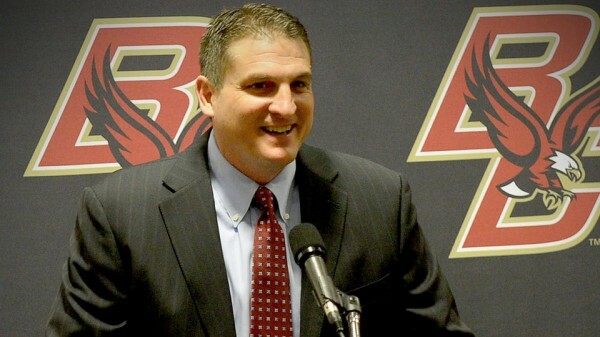 Boston College (12): A year and coach removed from last year’s disappointing effort leave a lot of questions in Chestnut Hill. Olivier Hanlan will always be worth the price of admission, but he may not have enough supporting cast to escape the dregs of the ACC unless Dennis Clifford can finally stay healthy. 14. Georgia Tech (10): It’s really hard to see Brian Gregory surviving as coach here if the Yellow Jackets don’t make the postseason this season. It’s also hard to see this Georgia Tech team finishing in the top half of the ACC, which is what it would probably take to get that NCAA bid — or even a trip to the NIT. The odds of Gregory being in Atlanta after March 2015 are not very good. 15. Virginia Tech (6): Virginia Tech will again be among the cellar-dwellers in the ACC, but at least it has come cachet with the hiring of Buzz Williams. They’ll be serviceable in the backcourt with Devin Wilson returning, but it will be a year or two before we can evaluate the viability of the Hokies as competitive in the conference. Coach K reloads: Duke was the top choice again this year with another one-and-done big man, but the Blue Devils weren’t the unanimous pick. Virginia and Louisville both got a first place vote. Clear Contenders: North Carolina, Louisville and Virginia (in some order) rounded out everyone’s top four, marking a distinct upper tier in the conference. Media/Microsite solidarity: For the second season in a row, no teams differed from the preseason media poll by more than two spots. Can Pittsburgh overcome key personnel losses and injuries to compete with the ACC’s big boys? Last year was Pittsburgh’s first season in the ACC, and the Panthers came out of the gate like gangbusters, winning 18 of their first 20 games and starting conference play with a 6-1 record. Then things headed south as Jamie Dixon’s squad limped home, finishing fifth in the league with an 11-7 mark. There was even some talk that Pittsburgh was on the bubble before they won two games in the ACC Tournament to secure an NCAA bid. Now the Panthers are ready for a second go-round in an improved ACC, but without the services of last year’s two best players, Lamar Patterson and Talib Zanna. The explanation for last year’s dropoff midway through the ACC season was twofold. The primary reason was a series of injuries that ran through the squad like a mini-epidemic. Durand Johnson was Pitt’s third-leading scorer when he tore his ACL in a January win over Wake Forest, immediately ending his season. While his was the only major injury, the team was soon beset by nagging ailments that seemed to hit at the same time. Patterson was mentioned as a possible ACC Player of the Year candidate before a hand injury caused the senior to lose his shooting touch. Zanna played through a severe ankle sprain, but the injury zapped him of his explosiveness and caused the Panthers staples — interior defense and rebounding — to suffer immensely. Others that played hurt were freshmen Michael Young (back) and Chris Jones (thumb). The second problem was that the schedule got tougher after that excellent ACC start, and the Panthers subsequently went 0-5 against the ACC’s top four teams. That issue, combined with an extremely weak non-conference slate (278th nationally), is what put Pitt in the position of needing quality wins in Greensboro to ensure a trip to the NCAA Tournament. The Panthers got that cherished victory when they barely held off North Carolina in the ACC quarterfinals. Can Dixon’s squad avoid the same scenario this season? Pittsburgh suffered a significant blow when it announced that fifth-year senior Cameron Wright would be out for ten weeks after undergoing surgery on his broken left foot on Friday. Wright averaged 10.5 points, 3.2 rebounds, and 2.6 assists per game last season and is the Panthers’ leading returning scorer after scoring just 4.3 points per game as a sophomore. Wright is expected to return just before Christmas meaning that he will miss the team’s Maui Invitational trip and their ACC/Big Ten Challenge match-up against Indiana, but should be back in time for the start of ACC play. Ty Hudson, one of the top point guards in the class of 2015, committed to Clemson on Saturday giving Brad Brownell his first commitment in the class of 2015. Hudson committed while on his official visit at Clemson, but the bigger factor was probably the team’s new assistant–Ritchie Riley–who had recruited Hudson while he was an assistant at UAB and is widely attributed as the driving force behind Hudson’s decision to go to Clemson. Hudson had also been looking at Mississippi, Oklahoma State, and South Florida. ESPN will have a new voice on-air next season as Jim Calhoun will be working with the network. Calhoun, who has been promoting a documentary in advance of its premiere next week, has not finalize the details of what his work will entail, but he is expected to be doing studio work at ESPN. We never know how coaches will translate to television, but after the Bob Knight experience the past few years we are looking forward to seeing Calhoun on TV particularly when he is talking about that team from upstate New York. Carlton Bragg, a consensus top-20 player in the class of 2015, will take a visit to UCLA on October 31 after having an in-home visit with Steve Alford. Bragg, a 6’8″ power forward out of Ohio, has narrowed down his list to Arizona, Illinois, Kansas, Kentucky, and UCLA. He already has two visits set up at Kansas (October 10) and Kentucky (October 17) so this would be his third planned visit, but according to reports Bragg does not plan on committing until the late signing period so we would not expect an announcement any time soon. Former Louisville commit Antonio Blakeney has set-up visits at Missouri (October 17) and LSU (November 7). Blakeney as you may remember backed out of his commitment to Louisville less than two weeks after his initial commitment. As we have stated before, many suspect his recruitment is being influenced by Blakeney’s Nike AAU connections, which was obviously in conflict with Louisville’s adidas contract. The other two schools on Blakeney’s list–Kentucky and Oregon–are also Nike schools so you can figure that this will be followed closely by fans on all sides. In anticipation of the new marquee ACC match-up this afternoon at 4:00 PM EST, microsite columnists Matt Patton and Lathan Wells ask each other the tough questions. Somehow, we only mention CJ Fair once. Lathan: Tyler Ennis has proven to be a freshman beyond his years at the point, with a demeanor that belies his class. Can anyone disrupt him defensively and thus help stymie what Syracuse wants to do on offense? Matt: Calling Ennis a surprise is disingenuous because everyone expected him to be really good. People just didn’t him to be this good this quickly. He’s made the offense more efficient by replacing Michael Carter-Williams, the current NBA Rookie of the Year front-runner. But Pittsburgh will likely try to make the freshman uncomfortable by sealing off the lane with face-guarding on the perimeter. Pittsburgh has some of the best ball movement in the country (seventh nationally in assists per field goal made). How will Syracuse’s zone combat it? Lathan: In short, the zone makes ball movement the key to staying in the game. Syracuse’s length across its lineup forces teams to keep throwing the ball around the perimeter and causing teams to hurry late in the shot clock to get a good shot. Establishing a solid high-low option is probably the key to having some sort of success on offense. Four Thoughts is our way of providing some rapid reactions to some of the key games involving AAC teams throughout the season. The defense of Sean Kilpatrick (right) and his fellow Bearcats was key in Cincinnati’s 44-43 win over Pittsburgh at the Jimmy V Classic on Tuesday. It is clear that the question that will determine Cincinnati’s fate this year is whether their aggressive defense can overcome their inept offense. It did so, barely, Tuesday night in Madison Square Garden. The Bearcats held the Panthers without a field goal for more than 11 minutes of game action, bridging the half, but only managed to outscore punchless Pitt 6-5 over that span. After a veritable offensive explosion in which Pitt made four field goals in less than three minutes, Cincinnati endured an even longer drought, failing to make a field goal for more than 13 minutes. And yet, Cameron Wright‘s driving layup with 1:09 remaining gave Pitt a 43-42 lead. Admittedly, a key reason the Panthers failed to connect from the field was that Cincinnati continually chose fouls over allowing points in the paint; Pittsburgh shot 29 free throws (making 19) to Cincinnati’s three. But between all the fouls, the Panthers hit only 11-of-33 field goals, a testament to the consistent defensive pressure they faced all night.